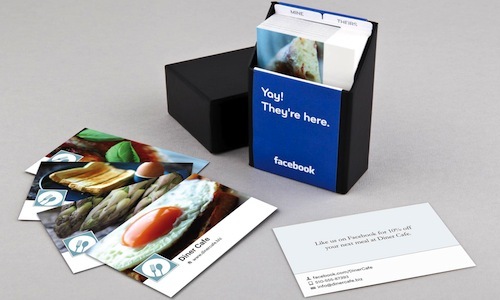 Moo.com — the company behind the Facebook Timeline-themed cards that launched earlier this year — is now expanding the offer to include businesses. 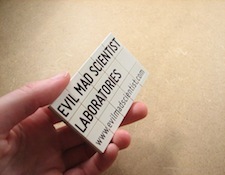 The new offer allows you to design business cards using details from your Facebook Page, including images. You’ll receive one pack of 50 cards for free. Additional packs will cost $15 each plus shipping. “As global businesses and brands, large and small, and their agencies seek new ways to catch attention and take advantage of new marketing channels, we believe this free offer will be a much-sought after additional tool to add to their marketing suite,” explained Richard Moross, CEO and founder of Moo. You can make your cards stand out by taking advantage of Moo.com’s “Printfinity” feature, which allows you to select a variety of different images to be printed on the cards. For example, restaurants can highlight favorite dishes or specials. The cards might not be practical for every type of business, but they offer a creative way for your business to stand out among the others. If you’re interested, you can start designing your Facebook cards today.